While the Land Acquisition Bill is likely to be referred to a joint committee of Lok Sabha and Rajya Sabha, the Goods and Services Tax Bill will be sent to a Rajya Sabha panel. The government on Monday appeared to have blinked in its ongoing stand-off with the Congress in Parliament by agreeing to refer two key Bills related to land acquisition and Goods and Services Tax to special panels for further review. Both the Bills are flagship economic reform legislations. According to sources, the government is likely to refer the Land Acquisition Bill, which was introduced in Lok Sabha on Monday, to a joint committee of both Lok Sabha and Rajya Sabha. The GST Bill, passed by the Lok Sabha last week, will be sent to a select committee of the Rajya Sabha. The 30-member joint committee could have 19 members from the Lok Sabha and 11 from the Rajya Sabha. The Select Committee will only have members from the upper house. Both these panels are expected to submit their reports in the next session. Besides the Land Acquisition Bill and the GST Bill, a united Opposition had last week forced the government to refer another Bill related to regulating the real estate sector to a Select Committee of the Rajya Sabha. The only hope for the three Bills will now be in the monsoon session of Parliament in July as the budget session ends on May 13. "Both the Land Acquisition Bill and the GST Bill should be sent to parliamentary panels for further scrutiny," Congress spokesperson Anand Sharma said. According to Sharma, the Congress is opposed to the Land Acquisition Bill as it negates an earlier Act passed by the UPA government in 2013, which required no changes since the BJP had also supported it. Congress vice-president Rahul Gandhi has already started a nationwide protest against the Land Acquisition Bill, branding it anti-farmer. He had also attacked Prime Minister Modi over the issue in Parliament. The government has been pushing the Land Acquisition Bill, saying it needs to be passed to create rural infrastructure which will help develop the Indian economy and address the farmers' concerns. "We don't want any changes in the Land Acquisition Act 2013," said Sharma. Sharma further said that though the Congress supports the GST Bill in principle, as the UPA had also tried to pass it, his party wants the legislation to be referred to a Select Committee of the upper house as it has certain new amendments relating to Centre-state relations, which need further parliamentary scrutiny. The Congress leader squarely blamed Modi over the GST Bill, saying he had earlier opposed the tax reform legislation as Gujarat chief minister during the UPA. "We had tried to pass the GST Bill, but Modi had opposed it then as Gujarat CM," he said. While the Congress could do little in the Lok Sabha, where the NDA enjoys a brute majority, in blocking the GST Bill last week it did not allow the Rajya Sabha to function on Monday demanding Union minister Nitin Gadkari be removed as his company Purti Group has been named by a CAG report for alleged financial irregularities. The upper house was adjourned nine times on Monday while it was adjourned six times on Friday when the Congress did not allow the Rajya Sabha to function over the same issue. "The report is being deliberately misinterpreted for political reasons," Gadkari said. 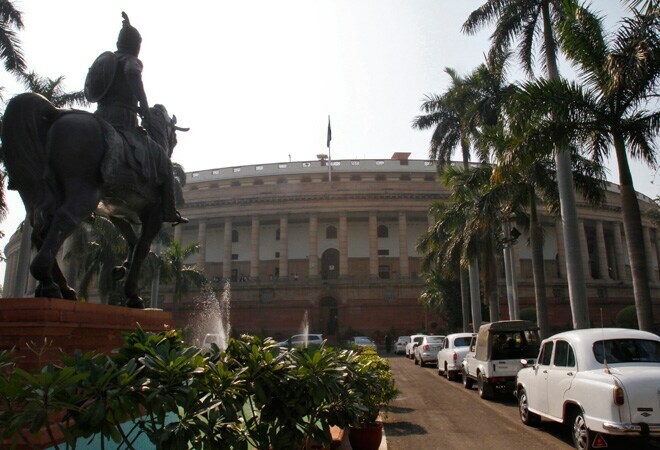 Most of the Opposition, including Congress, Left parties, NCP, TMC, RJD, SP, BSP walked out in protest over the introduction of the Land Acquisition Bill in the Lok Sabha on Monday. The Congress had also walked out in protest when the Lok Sabha passed the GST Bill last week. The NDA lacks strength in the Rajya Sabha, where the Congress-led Opposition is able to dictate its terms to the government. Though government managers claimed they had the support of regional parties including the TMC, SP, BSP and BJD, the GST Bill is a Constitution Amendment Bill and requires two-thirds majority to be passed. "No Constitution amendment is possible without the Congress," said Sharma.